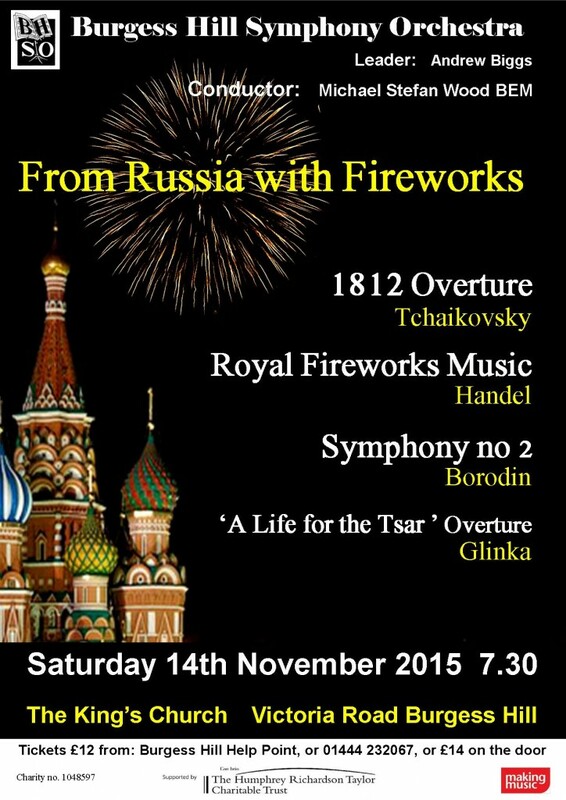 On Saturday 14th November 2015 at 7:30pm Burgess Hill Symphony Orchestra will present “From Russia With Fireworks” in The King’s Church, Victoria Road, Burgess Hill, RH15 9LR. Led by Mike Wood, the orchestra will celebrate the work of some of most prolific Russian composers of the 19th century. Glinka is widely considered to be the fountainhead of Russian music and was a great influence on fellow Russian, Borodin. Tchaikovsky became the first Russian composer to be widely known internationally. His patriotic 1812 Overture was written to celebrate Russia’s defence of its motherland against Napoleon’s invading Grande Armée in 1812. The evening concludes with some British patriotism in the form of Handel’s Music for the Royal Fireworks, commissioned by George II to celebrate the end of the War of the Austrian Succession (1740–48). Tickets are £14 on the door or £12 for tickets purchased in advance. Accompanied under 16’s free (ticket required).